Mumbai is bidding a tearful farewell to Anti-Terrorism Squad chief Hemant Karkare while Bangalore gets ready for the cremation of National Security Guard commando Major Sandeep Unnikrishnan. Karkare was killed along with two other top policemen, Additional Commissioner of police Ashok Kamte and police inspector Vijay Salaskar at Cama Hospital near the Chhatrapati Shivaji Terminal when they came under fire from terrorists on Wednesday night. His colleagues, visibly moved, paid homage to the senior officer. Karkare is survived by his wife Amruta, his two daughters Jui and Sayali and son Akash. The 54-year-old police officer had a career spanning 26 years. Originally from Madhya Pradesh, he studied mechanical engineering in Nagpur. Karkare served as Superintendent of Police in Chandrapur, Maharasthra primarily fighting Naxalites from 1991 to 1993. He was also an Assistant Commissioner of Police in Nagpur. Known as an upright officer, he served in the Research and Analysis Wing (RAW) for seven years. He returned to his state cadre to head the ATS in Jaunary 2008 and is credited with solving the serial bomb blasts in Thane, Vashi and Panvel. He and his team faced severe criticism from Bharatiya Janata Party leaders for probing the involvemant of Hindu leaders in the Malegaon blast case. 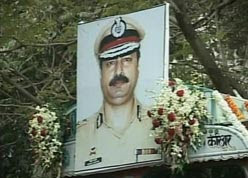 Only last week, Pune ATS received phone calls threatening to blow up Karkare's residence. But when a journalist asked him via SMS whether it was true or false, his response was just a smile. 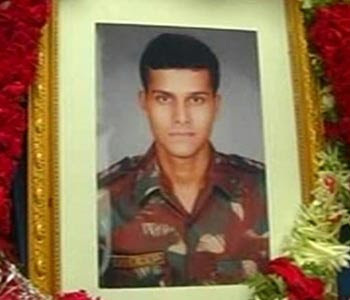 Major Unnikrishnan was martyred on Friday morning while trying to save one of his colleagues at the Taj.